Also known as “go home peaches, you are DRUNK.” Which is what I wanted to name the post, but you know, search engines and stuff, so Maple Whisky Peaches it is. The Maple Whisky Peaches made my house smell AMAZING, yes, so good I need to shout at you. 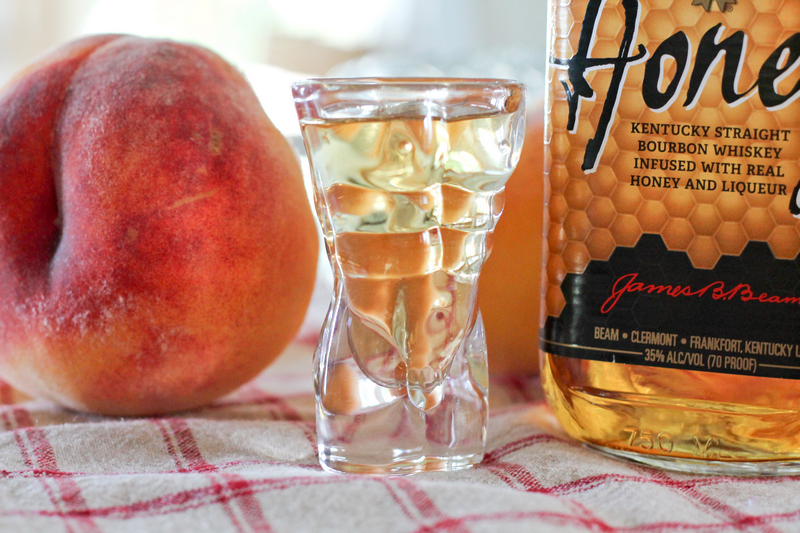 Think; rich malt spirits with sweet peaches all covered in maple deliciousness. Yes, are you drooling yet? These aren't strict paleo, so if you are the paleo police, please pretend you never saw this. You can, of course, substitute hot water for the liquor for a grain free, and non-alcoholic version. They would still be delicious, and alcohol is not for everyone. I wouldn't be upset, and in fact, I made some like this for my nieces and nephews, just make sure to label them accordingly for obvious reasons. The 3-year-old is already falling all over the place, the last thing he needs is a drink. This deliciousness in a jar was inspired by a great recipe for bourbon soaked cherries. I figured for my first canning endeavor I would paleo-ize the recipe, and if it failed, I would simply HAVE to eat said bourbon soaked cherries. Darn. They all sealed, and I gave them to my staff, so thank you to Kristi over at www.sheeats.ca This is all your fault… inspiration. My staff raved in appreciation for the boozy cherries, and I got to be the “best boss ever.” At least for a little while. I am a bartender deep in my soul. No matter what I do or where I go, it's my true calling. The mixology, the fresh flavor combinations, the new and great spirits released every year, make my pulse quicken with excitement. OH! the things I could create! I am not a big drinker, I rarely drink during the week, and the last time I was drunk, well, it was accidental. I enjoy messing with being entertained by intoxicated people. I love throwing a good party, and mingling. A true extrovert, I relish small talk and listening to peoples stories, sometimes just watching people… regularly I miss being behind that big wood (or metal, or stone) bar. A rag in hand and an arsenal of amazing spirits stacked neatly and gleaming on the wall behind me, a party of people before me. Shaking martini's, layering shots, building icy cocktails, perfectly spiced Caesar's with a tower of pickled perfection perched on the rim, the rich legs on the glass of good wine, even pouring the elusive picture perfect draft pint is so satisfying. I enjoy the creative craft of being a barkeep. The reason I no longer do it? Well, I'm not as patient as I once was, bartending gigs are nights and weekends, great in your 20's but living like a vampire, is no longer in my cards. It's also human nature to remember the good things; the beautiful drinks, the laughs, the great stories. Not the clogged glass washer that floods your bar with sludge and soaks into your new boots, fights and mean drunks, or the waitress who doesn't know what she's doing and spoils a tray of perfection before it makes it to the customer. These days I satiate my need to bartend doing friends weddings, cocktailing at parties and cooking. And now canning. 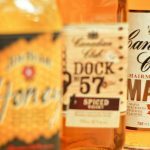 The good folks over at Beam global have released some incredible infused and flavored whiskys. I used Jim beam Honey, but the Canadian club dock 57 spiced, or the newest member of the team; Canadian club maple would do the trick, you could even omit the maple syrup, making room for more whisky! Without any further delay; Maple Whisky Peaches! 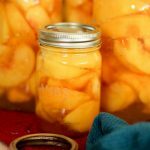 Fill jars with peaches, get as many in as you can, really shake them into the jars, firmly yet gentle, you don't want mush. 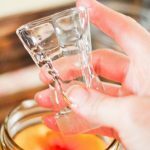 Put 3 oz of whisky into each jar, should fill to the shoulder of the jar, you can add a touch of boiled water to top it up, or more whisky, up to you. Lightly tighten lid over jar and place in a boiling water bath for 15 min. Remove and let cool. 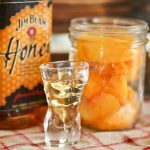 Any jars that don't “pop” aren't sealed and must be refrigerated and used right away (darn it!). How has nobody commented on these shot glasses??? Those are some nice shot glasses 🙂 and I’ll have my boozy peaches over coconut ice cream please! Damn straight Laureen! …er, I’m referring to the ice coconut cream. The recipe ingredients list.. 8 tsp maple syrup, The directions say, Put 1 tbsp. 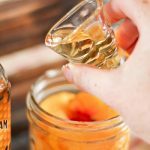 of maple syrup into each jar over the peaches. So is it 1 teaspoon or 1 tablespoon? Oh shoot! Thanks for catching the typo Barbara! 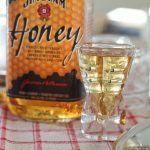 I used a teaspoon, but of course if ypu want a sweeter taste you can use a tablespoon! I’ll go fix that right now! 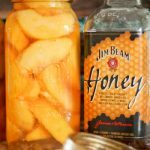 Does the canning process evaporate the alcohol? Some of it I’m sure, but not all of it. They are still boozy! 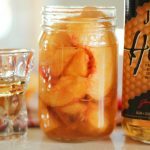 Does the 3 oz of whiskey and maple cover the peaches entirely or do u fill it to the rim with water also to make sure the peaches are covered the whole way? Or don’t they need to be completely covered or the jar filled up with liquid the whole way? It all depends on how well you pack the peaches in there! The 3oz went just to the neck of the jar for mine. You can absolutely top up with water or a simple syrup, depending on how you feel about sugar water. I used half pint jars, usually jelly jars are around that size. I collect jars all year so they arent all the same size/shape. 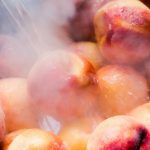 As long as you have the peaches mostly covered, with a 1/2 inch head space, and hot; jars, lids, liquid, and a big enough canning pot to cover the jars you choose, it should be good! Nonsense! Ask away! Asking lots of questions is always good! 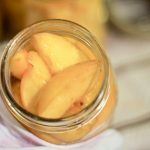 Okay, because you are preserving in alcohol, if you have a few jars that don’t seal, you can keep them refrigerated for a good 8 weeks without issue. Once the jar is sealed you can open and enjoy them right away, but with the pickling process you optimally want the jars to sit somewhere cool and dark-ish 4-6 weeks. So the food really absorbs the “brine” (in this case booze). They say a home canned product has an approximate shelf life of a year, but I doubt they will last that long! Good luck! Don’t understand why you are processing these peaches. 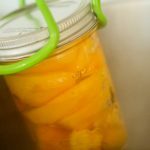 I have been making fruit in whiskey or rum for many years and I never process. But I don’t add water either. Alcohol is a preservative and nothing lives in it. I add a cinnamon stick and sugar to each jar ad well for flavor. Hello Mary, true you don’t HAVE to process fruit in straight alcohol in sterilized jars, but giving them as gifts, and to my staff I want them to be shelf stable, and sealed. Trying to stay away from added sugar, but the cinnamon is a great idea, I add it to my canned pears! Actually, if you are using at least 70 percent alcohol, added sugar or not, the jars do not need to be processed. Nor do they have to be sterilized, just clean. The alcohol will kill anything harmful, and it is the best preservative. You can add cinnamon, or star anise, vanilla extract etc for added flavor. 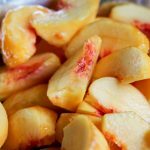 I have made this for Christmas gifts for family and friends for years using peaches, cherries and pineapple! Absolutely! Make sure fruit is entirely covered! Can you serve this with ice cream? Oh course you can, nice cream too if you are looking for a non dairy option. hi. I’m wanting to make them for my cozens wedding gift. how long ahead should I make these?? Whenever peaches are ready!! They last in the jar a little over a year, and then the texture starts to change, and really they are good 1st made. Trying to link to the black manhattan recipe and it will not let me, do you have a recipe for them. Sounds delicious. It’s sad when links stop working! I’ll fix that up, here is a recipe similar to the black martini! Fabulous. Just canned some peaches with room for whiskey. Delicious!! Peaches are ready here and I’m about to do the same! Do you think frozen peaches would work ok? They would lose their texture, and likely would discolor after being frozen giving you more of a sauce. But the flavor would be good!